On the northern coast of Finistère, the Cap Ouest hotel is situated in the quiet seaside town of Plouescat. The sea is just in front of the hotel and the casino is just behind. On the northern coast of the Finistère region , the Cap Ouest hotel is situated in the quiet seaside resort of Plouescat. The sea is just in front of the hotel and the casino is just behind. The 3 star Cap Ouest hotel belongs to the Brit Hôtel independent hotel network. It boasts 41 rooms, half offering fantastic views over the Channel, and some of which are family rooms with their own large private terrace. 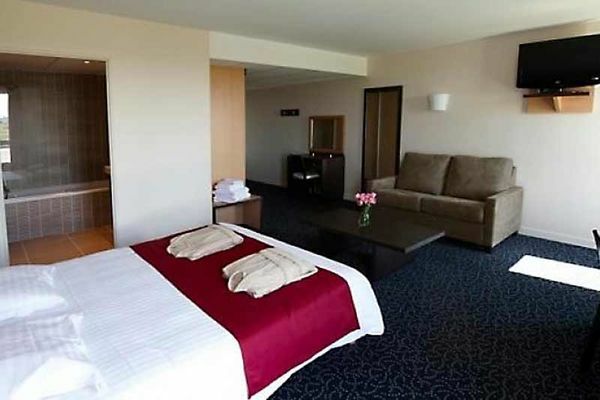 Modern and plush, and often used for seminars, the hotel also has a well-being centre for a truly relaxing stay. The balneotherapy area has an indoor heated pool, Jacuzzi, sauna and massage room. The hotel’s restaurant , overlooking the sea, offers a menu based on produce fished locally and brought straight from the fish market to your table. And if you fancy taking in some fresh sea air then you’ll be spoilt for choice with the dunes, rocky coastline and fine sandy beaches to walk along. Close by, the kids are sure to find something to do: sand yachting, sea kayaking, and horse riding are just some of the activities on offer.